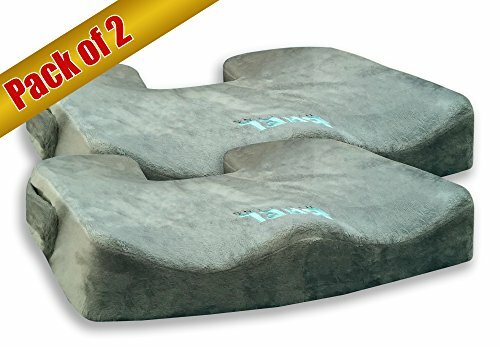 Bael Wellness Seat Cushion (2 Pack) for Sciatica Coccyx, Orthopedic, Tailbone and Back Pain. – Slopes, edges & curves create comfort to pressurized area. – Encourages correct sitting postures. – Appeases risk of sitting long hours. – Long drives, flights & seated work. – Hip pain & pelvic pressure. – Bruised, fractured or broken tailbone. – Hernia & pressure ulcer. – General pain or numbness due to sitting for long time. – ASSISTS IN BACK PAIN NATURALLY. – Doesn’t flat even after longer use. – natural balance ball effect. – Newly designed anti-sliding grip provides strong grip on any surface. – Dense memory foam adjusts to most body weights. – Cylindrical panes with slope to complement body shape is proven to be more beneficial in coccyx pain than slope alone. – Dedicated & focused customer service. – Easy to carry water resistant box.